Burj Al Arab, one of the world's most luxurious hotels based in Dubai, recently unveiled its fully transformed aquarium, with an innovative decor and newly-introduced exotic species of fish. The recently re-opened aquarium also boasts of some of the most technically advanced underwater lighting, new artificial coral reefs and improved filtration systems. 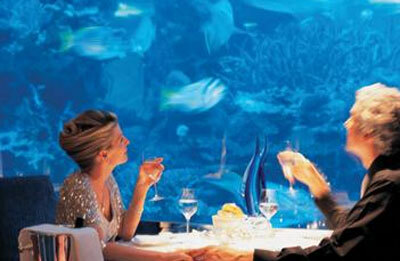 The fish tanks at the Dubai hotel are a captivating attraction for both guests and local visitors, with the resident marine biologists being highly commended for their great efforts in looking after its stock. Going beyond the standards usually found in commercial aquariums, Burj Al Arab has its own aquatic quarantine facilities, ensuring the fish were kept in a perfect condition during the three-month refurbishment. "We take extreme pride in nurturing our fish and providing it with as natural an environment as possible. Therefore we designed the best possible undersea 'home away from home' for our new and existing species," remarked Warren Baverstock, the aquarium operations manager at Burj Al Arab. "No live coral was used in the tank and the habitat was created to imitate natural coral reefs," he stated. The ultimate undersea habitat for over 4,000 fish, such as Zebra and Bamboo sharks, Clown Fish, as well as Yellow and Blue Tang, was created by Pangea Rocks in close collaboration with the aquarists' team to finalise the project. Burj Al Arab boasts of three aquariums: two are located on both sides of the hotel lobby and one is featured inside Burj Al Arab's award-winning seafood restaurant, Al Mahara. A hotel of Jumeirah group, Burj Al Arab, has been one of the most photographed structures in the world and has been consistently voted the world's most luxurious hotel.